This is an unusual combination and utterly irresistible. The strawberries are not too sweet and the citrusy notes of the coriander seed are not assertive, but just right. You could serve the strawberries with mascarpone or even just whipped cream, lightly sweetened. You could even try the strawberries as part of a cheese course. Adrienne demoed this at the US Botanic garden May 22 2014. Adapted from inspiredtaste.com. Heat oven to 375 degrees F. Line a baking sheet with parchment paper or foil. Drizzle with oil. Add strawberries to baking sheet; toss with brown sugar and coriander then spread into one layer. Roast strawberries 15 minutes until slightly softened and juices are released. Remove baking sheet and cool strawberries. Toss them together with the accumulated juices. 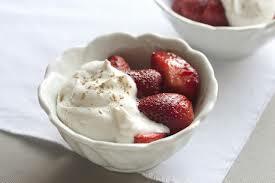 To serve, place a dollop of Greek yogurt in a bowl, add a spoonful of strawberries and garnish with paprika if desired. Strawberries will keep in the refrigerator about three days. Serves four. This entry was posted in Appetizers, Desserts, Vegetarian and tagged brown sugar, coriander, strawberries, yogurt. Bookmark the permalink.